If your circumstances allow it, setting up your own clone room is an invaluable way to maintain and improve your genetic library. 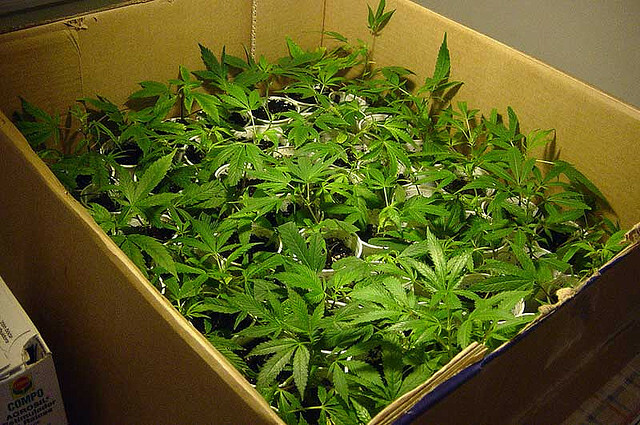 However, setting up a clone room must be done correctly if you hope to produce healthy clones on a regular basis. You don’t need much space to set up a clone room. If circumstances dictate, you can even fit out a wardrobe or cupboard to produce several hundred clones every few weeks. Preferably, however, you will have at least a large walk-in closet or small box room of at least 2-3 m2 to work with. 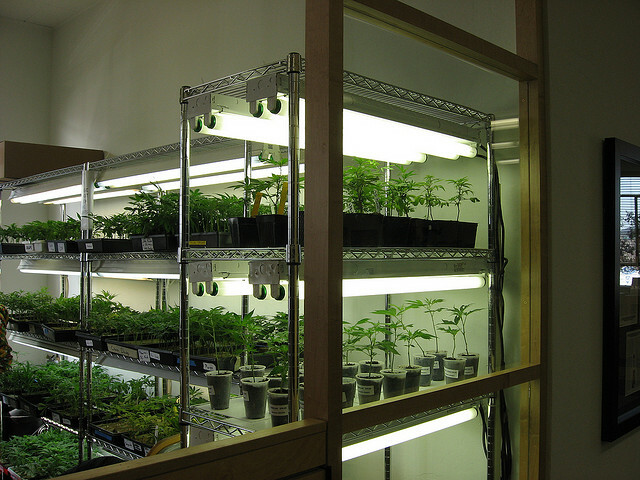 Setting up shelves is the obvious way to maximize space, as clones require very little vertical space and can easily be accommodated along with trays and lights in as little as 40cm of height. Your clone room should be clean and sterile prior to use. If possible, paint the walls with washable paint (white is ideal), and ensure that all surfaces are clean, and can be easily cleaned in future. Make sure that nothing but the essential items are in the room, so that cleaning can be as simple as possible between runs. The main thing to remember with lights intended for cloning is that they have to be cool. The typical high-temperature, high-output lights used for vegetative and flowering growth are far too harsh and hot for cuttings undergoing the rooting process. Thus, use cold fluorescent (CFL) or light-emitting diode (LED) lamps, and be sure to choose blue-white (“cool white”) light, as in springtime when plants naturally grow, the daylight is shifted more towards the blue end of the spectrum. In late summer and autumn, daylight shifts more towards the red end of the spectrum, which is why lights intended for the flowering period are more yellowish-red and vegetative lights are bluer. For clones, stimulating vegetative growth (i.e. growth of leaves, stems and roots) is obviously of the utmost importance. Although your cuttings will spend most of their time sealed in plastic trays or boxes to maintain high humidity, it is important to ensure that airflow in and out of your room is adequate. This allows you to effectively control overall temperature and humidity within your room; furthermore, good, clean air that is regularly replaced helps to prevent airborne pathogens such as mould and fungus spores from infesting your tender young cuttings. It is also highly advisable to filter your inflow of air through HEPA filters, to further minimize the chances of introducing pathogens from the outside world into your room. Filtering your air out is not so important, as clones produce very little odour, but you may want to use a small carbon filter on your outflow vent just in case. Lastly, while your clones should remain sealed in their trays for the majority of the time, it is vital to open the lids several times throughout the course of each day, to ensure that the air within the trays is replaced and that humidity does not become excessive. During these occasions, you should also be checking the clones for signs of disease, as well as to assess the general rate of rooting. Specially-designed cloning trays are available from most growshops, and are useful as they provide individual spaces for your cuttings to occupy, which helps to prevent roots of different plants from becoming tangled as they grow. There are also various complete hydroponic and aerop0nic cloner set-ups available, which comprise lights, trays, ventilation and irrigation all in one; ready-made set-ups can be quite pricey, but it is possible to build one’s own for significantly less. However, it is also possible to simply use cheap plastic trays or boxes without individual spaces for each cutting; if the roots do become tangled, it won’t harm your cuttings if they have to be cut. In fact, some growers believe that this harsh treatment encourages fresh root growth with more abundant branching. 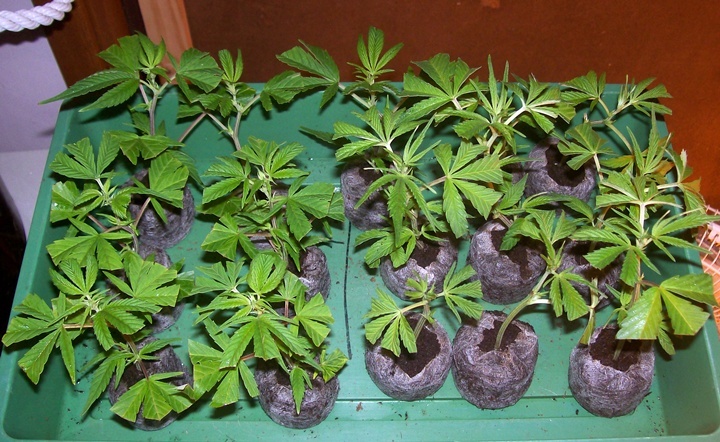 For taking the clones themselves, you will need rooting blocks (usually either rockwool or Jiffy cubes), rooting/cloning solution such as Clonex, sharp scissors or shears, and distilled or RO-filtered water, along with some mother plants! Optionally, you may also wish to use a sharp razor blade for trimming the stalks of your cuttings to 45° (and scraping the stems if desired, though this is not necessary and is time-consuming when producing large quantities of clones); you may also wish to utilize transplant solution to reduce stress. For a complete guide to taking clones, please see our tutorial. It is crucial that good standards of cleanliness are maintained at all times within the clone room. Change clothes and wash hands before entering, so that pathogens from the outside world are not introduced to your room. Wipe down surfaces and mop floors regularly; sweep or mop up spillages as soon as they occur. Spray cuttings every few days with mild pesticidal treatments, preferably organic, to prevent any pathogens from taking hold. Check your cuttings for signs of infection, and if any are noted, remove the affected cuttings immediately and proceed with damage-limitation steps. For one-off problems with pests, there are various curatives measures that can be taken. Where possible, it is best to use organic treatments at all times when growing cannabis or any other plant; however, if non-organic treatments are necessary, keep use to a minimum both in terms of quantity used and duration of treatment. If problems with pathogens become chronic, an overall reassessment of hygienic and environmental practices must be performed, and the room must be thoroughly cleaned and optimized for temperature and relative humidity before the next use. 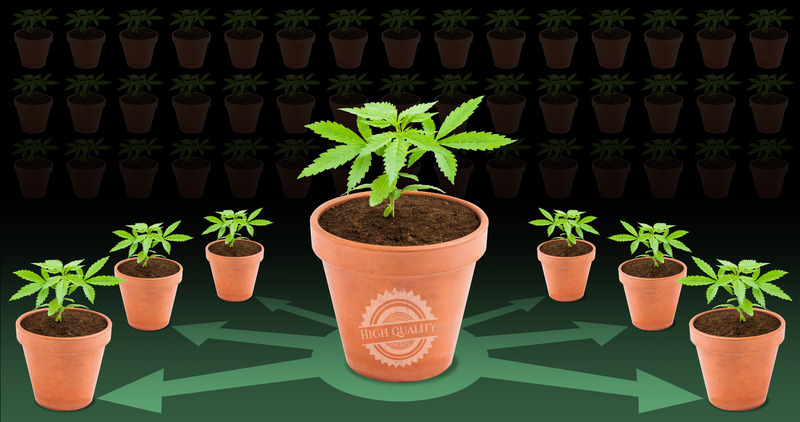 The post How to set up a high-quality clone room appeared first on Sensi Seeds English Blog. Geschrieben von: Sensi Seeds am05/01/2016. Letzte Überarbeitung durch: Psychotropicon, our reviewer, on 22/01/2016.